In the warmer months, I use more hair products because my hair becomes frizzy and unruly. I am always on the lookout for styling products and tools to tame the beast! Unwash Bio-Cleansing Conditioner ($36 USD) — Prep hair for a weekend of limited showers – Unwash is a new method to clean hair in a more civilized way, gently removing dirt and surface build up while locking in moisture, extending the life of hair color, and upholding you hair’s natural integrity. Essential moisture is locked in to restore balance and promote healthy, smooth hair. Combined with nourishing oils and extracts, hair is left soft more manageable, free of frizz and full of bounce, body and vibrant natural beauty. What I think: This smells amazing and is so moisturizing! I have been using it as shampoo and conditioner for about a week, and really like how soft my hair is. I have just been using a little product with it (see below) and my hair has been manageable. Plus, I’m happy that it feels clean and not greasy. 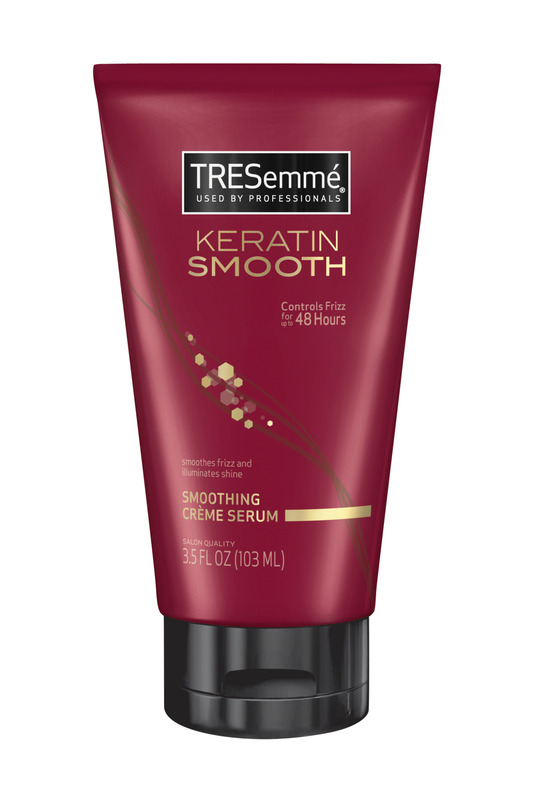 Keratin Smooth Smoothing Crème Serum ($4.99 USD) The lightweight formula of TRESemmé Keratin Smooth Smoothing Crème Serum smoothes away frizz for up to 48 hours and boosts shine. It controls frizz and fly-aways without weighing hair down, allowing you to enjoy shiny, satin-smooth hair all day long. What I think: I apply this after washing my hair while it is damp. Next, I either air dry or blow dry it and it helps control the frizz. My hair is soft and shiny! I love how affordable it is! NEW! 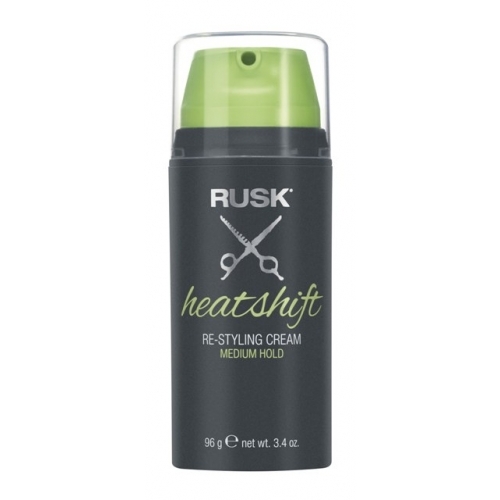 RUSK Heatshift ($18.00) — A restyling cream with a unique shapeshift ability that allows you to change up any style without the need to shampoo or re-apply product. Activate and reactivate with heat or hot tools to heatshift any style, anytime and anywhere. Provides color protection and strengthening benefits while reducing your blow dry and style time by 50%. 1st Style: Apply to damp hair. Style with blow dryer and styling tool for maximum results. 2nd Style: To restyle, apply heat from a styling tool. For maximum results set styling temperature above 120ºF/50ºC. No need to repeat Heatshift application after the first use! What I think: I use this when I am going to either blow dry or straighten my wavy hair. Apply on damp hair. Then, when I want to change my style with a curling iron or straightener, my hair takes the new style well and is still soft and shiny! Wet Brush Midi Brush ($8.99 USD) Detangle on the go with the new Midi Brush from Wet Brush. Smaller than the classic brush, but larger than the mini Squirt Brush, the Midi Brush offers everything we love about the Wet Brush, in a brush small enough to tote in any bag. Perfect for use on wet or dry hair, The Wet Brush quickly and painlessly detangles even the thickest, most stubborn strands thanks to its revolutionary Intelli-flex bristles. Because the bristles don’t pull or put up a fight, even the finest, thinnest hair can be tangle-free without damage. What’s more, the gentle ball tip bristles provide a massaging action that stimulates circulation at the follicle, a proven benefit for hair health. What I think: I have tried the Wet Brush before and I am really loving this smaller size! It fits better in my purse or gym bag. And, just like the larger Wet Brush, it detangles my hair quickly when wet (or dry)! invisibobble ($8 per box – 3 bobbles per box) — A fun and fashionable solution to the age old struggle of deciding whether hair should be up or down, invisibobble is the only tieless hair ring that leaves hair free of kinks and creases every time. Keep one (or a stack of colors) around your wrist to pull hair off of your face into a comfortable up do. Wrapped around any type of hair, the invisibobble distributes pressure onto several concentrated points around the ponytail, allowing for the hair to be held strongly, without being too tight or too loose. This effect of specific pressure distribution leads to a traceless result. Thanks to invisibobble’s no-tug features and smooth surface, women can avoid the common hair-tie headaches and prevent split-ends, both of which are often caused by a tight do’. The only tieless hair ring that is both anti-bacterial and hypoallergenic, invisibobble is made from polyurethane, better known as artificial resin, so it cannot harbor dirt or bacteria. What I think: I have been wearing these since I received them for review! They are easy to wear and hold hair perfectly, even at the gym! I like that they don’t tear at my hair or pull to tightly! Available in 8 fun and fashionable, bright and neutral hues, the invisibobble is sold at Urban Outfitters. What are you using for your hair this spring? Leave a comment and let me know!